A very special LAPIS LAZULI, Real, Pure and untreated, Massive 40.50 carats (Lajward). 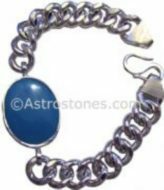 Lapis lazuli (lap-iz-la-zoo-lee) (sometimes abbreviated to lapis) is a semi-precious stone prized since antiquity for its intense blue colour. This opaque, deep blue gemstone has a grand past. It was among the first gemstones to be worn as jewellery and worked on. At excavations in the ancient centres of a culture around the Mediterranean, archaeologists have again and again found among the grave furnishings decorative chains and figures made of lapis lazuli ï¿½ clear indications that the deep blue stone was already popular thousands of years ago among the people of Mesopotamia, Egypt, Persia, Greece and Rome. This power is greatest when the energies of your mind and heart come togetherï¿½in other words, when you’re emotional and mental bodies are working in harmony. Lapis improves the connection, communication, and understanding between your heart and mind. In ancient Egypt lapis lazuli was a favourite stone for amulets and ornaments such as scarabs; it was also used by the Assyrians and Babylonians for seals. Lapis jewellery has been found at excavations of the Predynastic Egyptian site Naqada (3300ï¿½3100 BC), and powdered lapis was used as eyeshadow by Cleopatra.